::Artrageously Unique & Exotic ::: SUNDAY PRONAILS Nail Center OPEN DAY! 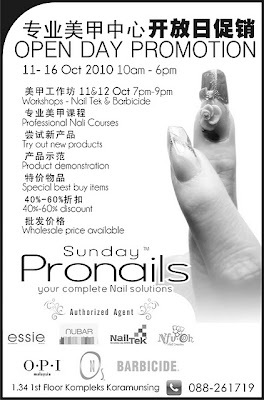 SUNDAY PRONAILS Nail Center OPEN DAY! SUNDAY PRONAILS Nail Center is currently having an ongoing OPEN DAY this week from today 11 to 16th October 2010 at Karamunsing Complex! and love getting pampered, this one is for you! You will also get a RM3 CASH VOUCHER to use on for discount item! And every PROFESSIONAL BRAND will be on SALE on that OPEN DAY! Oh my, just blogging about it makes me excited already!